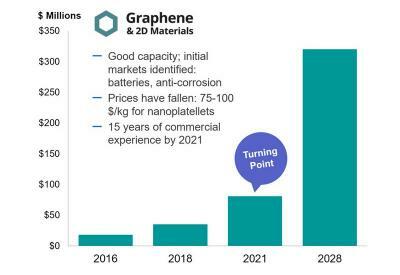 IDTechEx says that while graphene is still recovering from its hype curve, commercialization is making steady progress, with increased industry experience, availability - and volume sales. IDTecEx says that the market "inflection point" is expected to happen in 2021 - by then the industry will have an experience of over 15 years and sales volume will reach almost $100 million. By 2028, graphene revenues will reach almost $350 million. It is important to remember that graphene is an additive material, mostly, and so even small volumes may enable a large amount of materials and applications. In addition prices are expected to continue their fast decline.